Kaye and Paul Ketterer’s trip to Sorrento, Intaly in Fall 2016 included a day trip to Pompeii. buried for 1,700 years until excavation had begun in the mid-1800s. The amount of ash and debris needing to fill a seaport was evidence of the vastness of this devastation. 60,000 people had lived here, and when Vesuvius exploded, there had been time to evacuate, as the wind was blowing the ash out to sea. 20,000 stayed, however, either because they believed they were safe, or they were too poor to leave. The wind changed and the city became a picturesque hill, soon covered with vegetation. Excavators found preserved bodies of families seated at dinner, completely surprised by the blanket of ash that buried them in minutes. The site was so well preserved that many of the houses could have had thatch or tile roofs replaced and been habitable, at lease by first-century standards. The actual tour of the city was an adventure in mixed emotions. There was awe at the advanced engineering. There was deep sadness at the scale of death that was so overwhelming. Amid the spiritual pall was the fact that death was a part of the culture that developed the city in the first place, from the amphitheater where gladiators fought to the death and frequent public executions were entertainment, to the fact that physical labor was carried out by slaves whose lives were of no account. The entrance opened into a huge courtyard lined with huge columns in varying stages of preservation. We saw their basic construction of bricks covered with plaster. God and goddess statues had been in this hall, but all statuary had been moved to a museum in Naples. A few modern art pieces had been added, a puzzling contrast. An archway led to a piazza roughly the dimensions of a football field, lined on each side by what had been places of business and commerce, the Forum, or seat of business and government. The East side was now a fenced-in display of pottery and tools which had been unearthed. One very sad display was a cast made of one of the mummified bodies unearthed in the past century. Very much was intact. A pause at the very modern visitor center for refreshment of various sorts, and on we went to one of the public baths. The tile work and ritualistic set-up of one room leading to the next was fascinating. Here as everywhere was evidence of privilege served by menial labor. The self-tour then led to a series of streets consisting of a channel made of cobblestones with two-foot walls about six feet apart. At intervals, large stepping-stones allowed crossing, with gaps for chariot wheels. Water had fed into these streets, which served as the (un)sanitary sewer system. Pedestrian ways were on either side, with places of business and homes tightly built one attached to another. Some houses ran back from the street five and six rooms deep. Everywhere was tile work, brick on brick and a feeling of recent occupancy. Despite a fairly detailed map, the streets were not marked, and blended one into the next. All was on hard round cobbles. I’m sure we walked at least a mile in retracing steps. On one nondescript side street we saw the remains of the lead-pipe water system which fed the fountains every couple blocks where they obtained potable water brought to the city by aqueducts. There has been speculation that the Romans suffered from wide-spread lead poisoning as a result. The street at the edge of the excavation demonstrated how much was left buried, with fully-exposed houses on one side, and doors on the edge of a fill on the other. We exhausted-out and decided the mile-round-trip walk to the amphitheater was beyond our strength. I think the site where death was entertainment would have been too much for me emotionally. Exiting the site, we fortified with a delicious orange slushy, waited for the train in conversation with a couple from the UK bemoaning Brexit as we countered with the Trump disaster. In the end was awe at the human mind, at human resilience that makes the best of flawed social structure, the immense suffering of those at the mercy of wealth and power, and humility at how helpless all that is against the forces of Nature. Has there been much advancement? 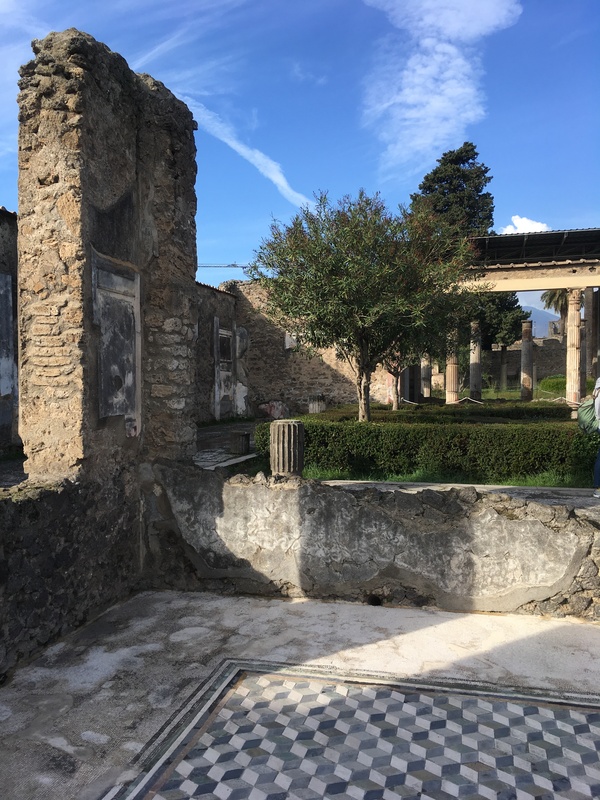 This entry was posted in Guest writer and tagged Italy, Pompeii, travel. Bookmark the permalink.